There are pioneers in every industry but sometimes a pioneer turns into an icon for all the wrong reasons. In Dead Shot Mary by Robert K. Benson, the life of a fascinating figure is brought to the stage as see the real Mary Shanley. 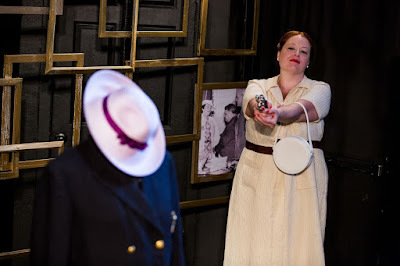 Performed by Rachel McPhee, Dead Shot Mary is more than a solo play about Mary Shanley, it explores the gender roles of the past that still exist today. Set up like a memory play, of sorts, this autobiographical stage play captures Mary's life from girl with a dream to rise as the infamous undercover detective gracing the covers of papers and magazines. But how did the fame really affect her career and personal life? Benson's exploration dives deeper than the surface. The content within his text is engaging. But the conceit is a bit muddled. With this being a solo play, establishing just exactly who Mary is conversing with his imperative. The result is the clarity of memory needs to be stronger. We watch Mary speak to an unseen person on a bus out of New York but when it shifts to active narration was not as seamless as it was required to be. Regardless, this is a play about Mary Shanley and the respect for the woman is what is greatly appreciated. We watched Mary as she unraveled from a life of work and fame. Despite being an inactive narrative, Stephen Kaliski found a way to bring variety into his staging. For a piece that lacks action, Kaliski kept Rachel McPhee moving and on her toes. In his storytelling, Kaliski assisted McPhee in finding the right emotional beat. The Bridge is a theater that can be a nuisance due to the extraordinary limitations of the space but Kaliski and his team did wonders to transform the venue to work for Benson's script. Scenic designer Kyu Shin created a small room with a back wall of gold frames, some featuring photos of the lady herself. Placing a body form with Shanley’s police uniform in view was a strong choice. The costumes from Peri Grabin Leong were evocative of the woman herself with a cream colored suit but the hat maybe have been just a tad too lavender. Adam Salberg created an impeccable soundscape through song and effect. Kaliski, Salberg, and McPhee were perfectly in tune to make the overall design flawless. Despite the lack of theatrical lights, lighting designer Haejin Han did wonders. Somehow Han isolated the worlds through color and diverse looks. Dead Shot Mary is a special show. When you find an actress who can embody the real person, it’s as if you’ve struck gold. Rachel McPhee was that. McPhee captured the essence of the women with a tough exterior but a heart of gold. Even with a tinge of a cartoonish voice, McPhee was authentic. It may not be perfect but if you’re interested in a refreshing solo piece, take a trip to see Dead Shot Mary.